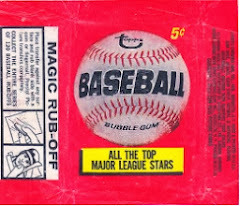 Here we have the last card for Frank Malzone (#152). 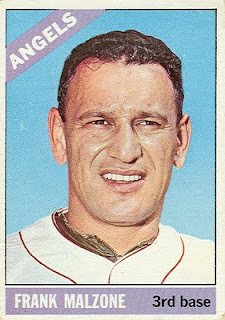 After 11 seasons with the Red Sox (whose uniform he's wearing here), Frank wrapped up his career in 1966 with the Angels. Malzone began his career in the Red Sox organization in 1948. He missed the 1952 and 1953 seasons due to military service. His major-league debut with the Red Sox was on September 17, 1955. 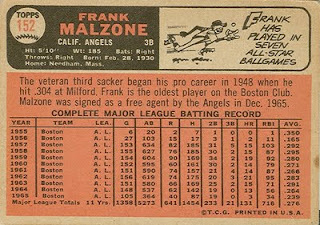 In 1956, Frank divided his time between Boston and their triple-A team in San Francisco. Frank took over the full-time third base job from opening day in 1957. (Billy Klaus, the 1956 regular third baseman, moved over to shortstop.) 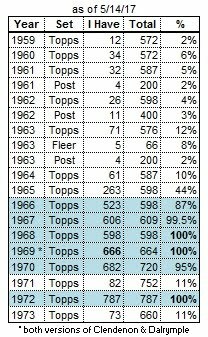 He finished 2nd in the rookie of the year voting in 1957, and played in over 140 games (all at third base) in every season from 1957 to 1964. 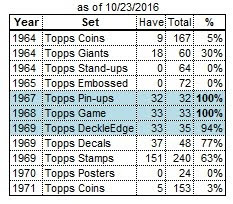 In 1965 (at age 35), time finally caught up to Malzone, as he shared the third base job 50-50 with 2nd-year man Dalton Jones. He was released by the Red Sox on November 30th, and signed by the Angels on the same day. In 1966, Malzone played in 82 games for the Angels - 35 at third base, and the rest as a pinch-hitter. He was released after the 1966 season.